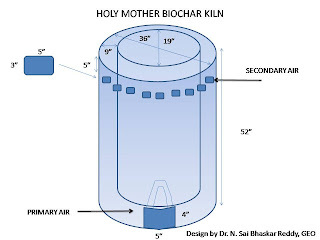 This is a very simple Biochar kiln recently designed for Sarada Mutt (Holy Mother), at Almora, Uttarakhand, India. Bricks and clay is used in the construction. This is a TLUD kiln. The biomass is to be added continuously as the fire continuous. The person adding the biomass to the kiln should be cautious and also use a long stick to keep away from the fire. 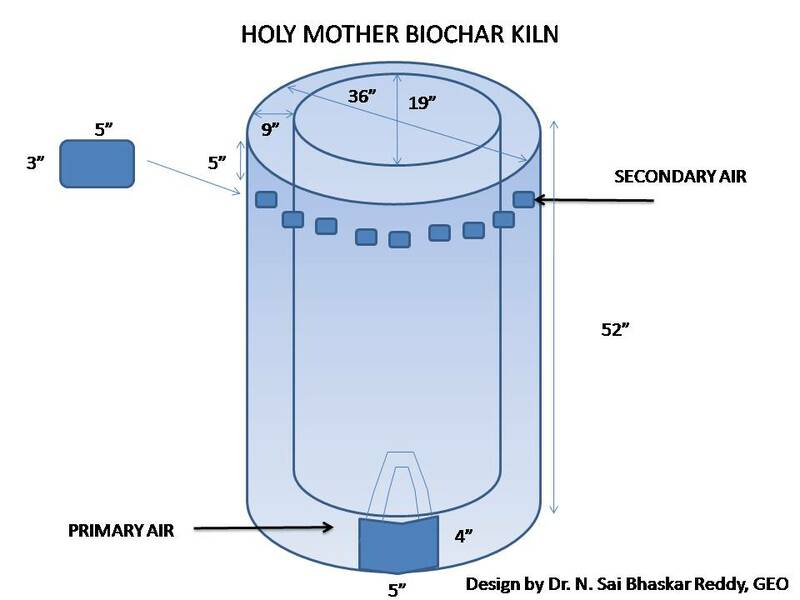 The primay air source at the bottom should be open as long as biomass is being added. As the biomass pyrolysis happens it occupies less space and more biomass can be added. It is convenient to operate during calm i.e., less windy days. As the biomass reaches the level just below the secondary air, the process of adding the biomass should be stopped. The primary air inlet should be closed. After waiting for some time water should be sprinkled to extinguish the embers (quench). The biochar can be collected immediately or after some time. This is the simplest of the process of using the wasted / waste biomass. Here pine needles are used for converting into biochar. Pine needles management is a big task in these parts of Himalayas, as often they lead to forest fires destroying many trees.